We begin, sat in a circle of perhaps 60 people on the floor of the sports hall at Caxton House where K.J. Holmes tells us that we have wings in our hands – between our fingers, in our shoulders and later she says, in our eyes. 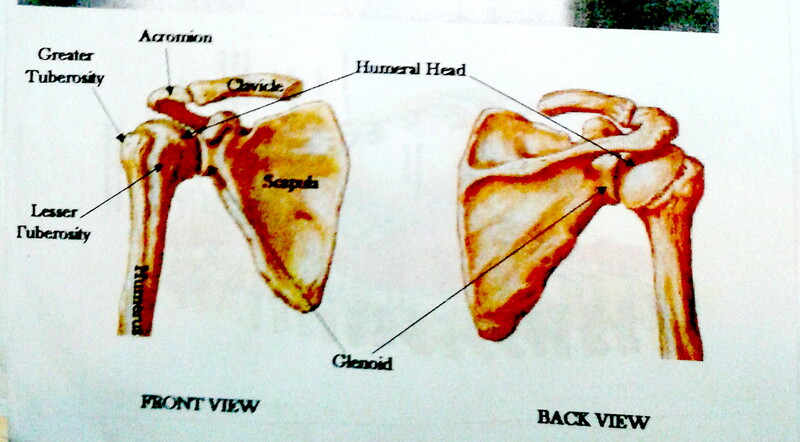 But it’s only after class the I understand her: she shows me her notes with an anatomical picture of our shoulder bones – scapulas, and says to me – those are wings. At the start of the class, I thought that the wings which K.J.Holmes described are the folds of skin between our fingers, under our arms and perhaps our eyelids. But it doesn’t matter if that’s correct or not – it’s the idea of it; the lightness we feel; and that we might take flight which matters. I recall publicity for a class with another teacher of Contact Improvisation which showed a picture of the the pelvic girdle and beside it, a butterfly with its wings outstretch in a similar shape: your pelvis is like a butterfly and it too can fly. As we are sat in a circle on the floor of Caxton House, K.J. Holmes demonstrates an exercise to us – you’re holding a giant ball in your arms she says with her arms stretched out in front of her. She slides the little finger of one hand onto the floor and rocks over from a sitting position. We all follow her action, and then reverse it until sitting upright again. It’s an exercise to develop an aikido like posture in dancing contact improvisation. The following day, I lead a workshop at Oxford Contact Dance. We start with a warm up, and I use the exercise K.J. Holmes showed us the day before. But this time, the six of us in the workshop are sitting back to back on the floor rather than facing each other in a circle. As we slide our little finger and hand onto the floor, we rock over. 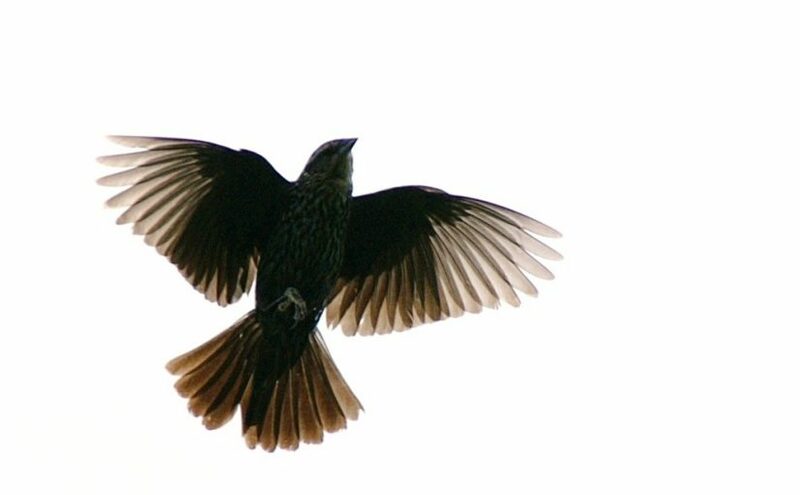 I say to the participants to turn their heads and look up to start reversing the movement – back to upright. When I look up, I see my other arm is in the air above me, and around it are the arms of other people in a circular design. We are a blooming flower perhaps – our hands the stamen of it? In the sports hall at Caxton House, we walk around, finding the spaces in the hall and between the dancers. K.J.Holmes is talking and she demonstrates another exercise: she walks up to me and puts her shoulder to my centre – just above my hip, and lifts me on to her shoulder. I give her my weight. ‘Do less’ she says to me. I relax and breath out, letting my body become limp and floppy. Am I flying? She walks me a while, on her shoulder and then puts me back onto my feet. Now we are working on the floor. K.J. Holmes shows a movement which is very familiar to me that involves rolling over the back of a person who is on all fours (the ‘base’) – in a table posture (bench/low bridge). We start in a similar position, like two four-legged animals shoulder-to-shoulder and next to each other. As the over-dancer lifts their pelvis and shoulders to roll onto the back of the base, the over-dancer’s shoulder bones lift – we are flying over them! 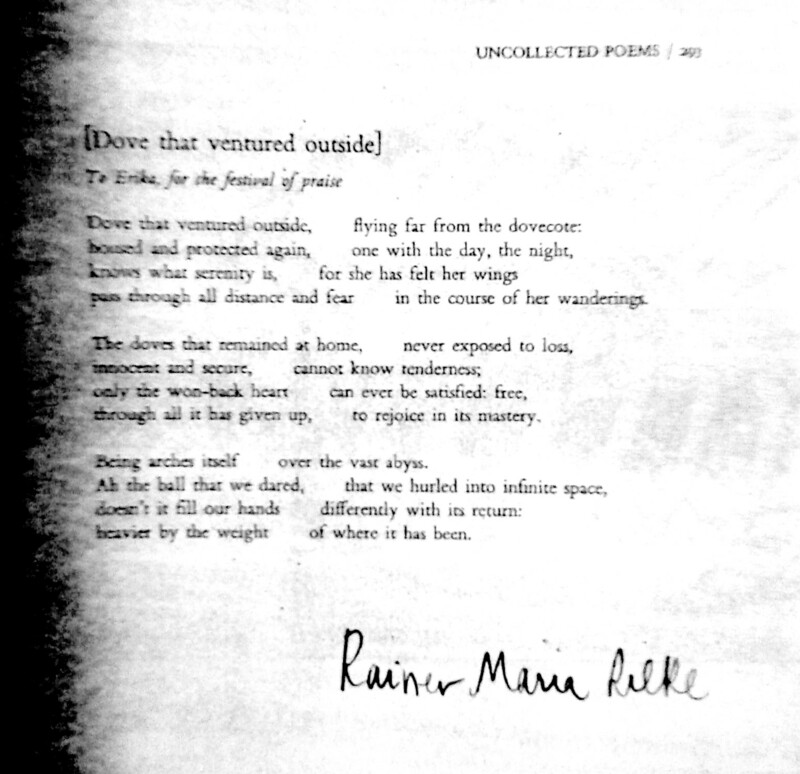 At the end of the class, K.J.Holmes reads a poem – ‘Dove that ventured outside’ by Rainer Maria Rilke (shown below or read it in a webpage).